We are a convenient single source for all of your commercial warewashing, housekeeping, laundry and maintenance cleaning needs. Barnell products and services always incorporate the latest industry innovations in chemical formulation, equipment and methods. We have complete flexibility to custom tailor a warewashing, housekeeping or laundry program to suit your company’s exact needs. We are not constrained by the rigid corporate pricing or policies that our competitors must adhere to. We partner with your company to help you control operating costs, and enable your employees to work more efficiently. 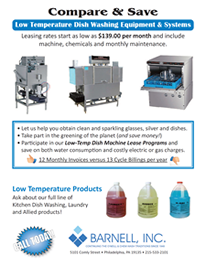 Barnell has a warewashing lease program to fit virtually any budget. 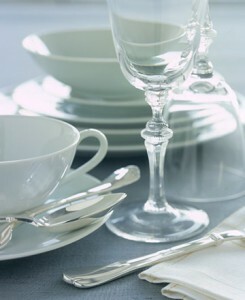 You will be able to economically produce sparkling clean, sanitary dishes that will delight your customers. We offer 24/7 equipment service – including holidays and weekends – because we understand that your business must always be up and running to achieve maximum profitability. We can even help reconfigure your present kitchen layout to ensure optimum functionality and efficiency. When you call Barnell during normal business hours, you’ll be greeted by a real person, right here at our Philadelphia headquarters. You will never have to deal with confusing phone prompts or automated call-routing systems. Our staff is trained to solve customer problems — not shuffle them from one department to another.